 Demanding yet eloquent and immensely rewarding personal documents of one of the century's leading literary and aesthetic critics. It's the grimmest of ironies that one of the earliest letters here should find the young philosopher standing metaphorically ``at a border crossing''--for Benjamin would end his life by his own despairing hand at a Spanish frontier post in 1940, his entry barred as he fled the advancing Nazi armies. Yet that image of the perpetual traveler on the threshold well suits the writer portrayed in these letters: equally a self-professed materialist devoted to the modern age and a bibliophile immersed in the literary past; close to many circles--Adorno and the Frankfurt School, Brecht's literary collective, Gershom Scholem's Zionism (the three men were among his correspondents, as well)--yet fully a member of none; a voracious consumer of the world yet always something of an outsider. The most bleakly memorable section here is the letters- -almost half the total--recording Benjamin's long and lonely years of exile, beginning with Hitler's seizure of power and ending with his own death. Here Benjamin faces up to his own uncertain prospects, as the material means for his work--living space, even the writing paper he coveted--dwindle and vanish. Constantly changing postmarks bear witness to his peripatetic and increasingly desperate search for refuge; above all, he bears witness to his growing sense of emotional and intellectual isolation. Yet he sets to his work, ``the shelter I step beneath when the weather grows rough outside,'' to recover something from the very culture whose collapse is about to engulf him--a quixotic venture that nevertheless compels our admiration. 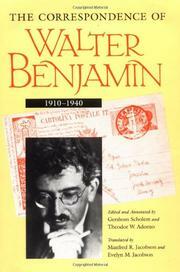 Unfortunately, this volume--simply a translation, with no new editorial apparatus, of the 30-year-old German edition--is a little unforgiving on the general reader: It's a shame the publisher hasn't supplied more biographical, historical, and cultural context to encourage nonspecialists to make Benjamin's fascinating acquaintance.